A tiger tattoo is among the popular designs in both Eastern and Western countries. For the Chinese, the tiger represents yang while the dragon represents yin. They are often displayed together to attain balance. The tiger represents powerful energy and also called king of the mountain by the Chinese. It is popular as a tattoo design and ranks right up there with the dragon. Some wear tiger tattoos with a fierce look on its face. This signifies the bold nature of tigers, which are also known to take other predators such as wolves, foxes, leopards, and jackals. Tigers are basically solitary and hunt on their own. In many Asian cultures, a tiger tattoo can have various meanings. It can stand for power, passion, ferocity, passion, or sensuality. In the West, a tiger tattoo is generally popular because of it stands for beauty and strength. These designs are not limited to men, making them flexible. The tigress or the female tiger can be used to symbolise a daring woman or a passionate female. Tiger tattoos can also symbolise protection. They are often used to help protect against bad spirits, evil intentions, and enemies. Tiger images are used as charms or hung on walls to keep evil away. In Indian mythology, the tiger is the vehicle of the Hindu goddess. In Tibetan Buddhism, the tiger is associated with kindness and generosity. The tiger tattoos in different colours can also have different meanings. A yellow tiger represents the sun, a white tiger represents the earth, a black tiger stands for winter, a red tiger means fire, and a blue tiger represents fertility. Tiger tattoos are often placed on larger areas of the body such as the back, upper arms, thighs, and chest. Equally, they can be striking when placed on the wrist, ankles, or smaller areas. The lovely stripes on the tiger have long been popular in fashion and art. This natural beauty makes them popular tattoo designs, either in pure black tattoos or in orange and black stripes. Today, tiger designs are becoming part of tattoo fashion. Even celebrities have not escaped the appeal of these tats. Singer-songwriter Cyndi Lauper has one on her left ankle while the Asian American actress Lucy Liu has a tiger tattoo on her lower back. Angelina Jolie has a Bengal tiger tattoo extending from her lower back to her behind. 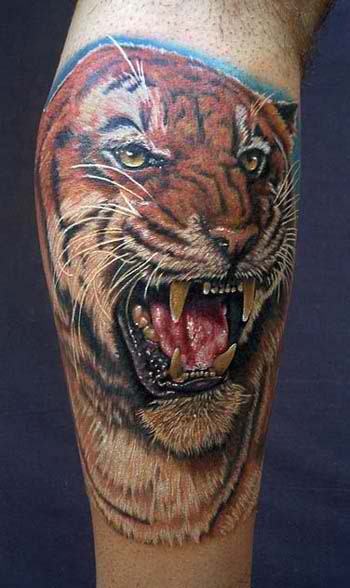 To sum it up, a tiger tattoo is a powerful form of body art. Its intricate striped pattern requires a blend of creativity and expertise on the part of the artist to bring out its distinctive meaning.